This next dress is described in Kushiel’s Chosen as a dress of white linen and a blue mantle. It’s plain but fine. The dress is something provided Phèdre when she is marooned on Crete. I looked to ancient Greek and Roman costumes for this. As an aside, I copied the hairdo from a wedding magazine! The white linen is for the dress, as is the grey/taupe binding ribbon. The blue dupioni is for the mantle. 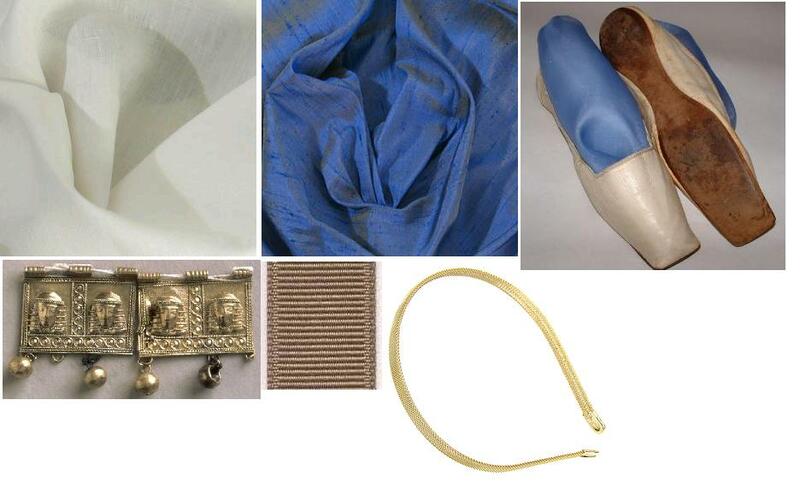 I have included a couple of accessories (hair band and cloak clasp) that I liked. I love that cape! Do you happen to have a pattern of it? Thanks!